As of August 1, 2018, Mediavine now pays all payments via our partner Tipalti, which allows publishers to select their prefered payment method. 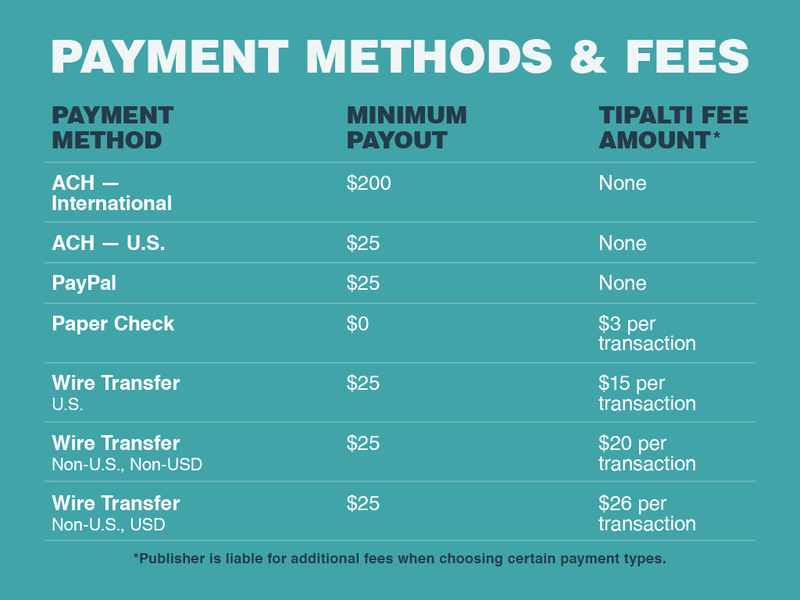 We made the decision to change our payment method from PayPal Mass Payments to Tipalti because it provides more flexibility for our publishers around the world. We have teamed up with Tipalti, a company that works with clients such as Outbrain, Vimeo, Amazon and many others. This partnership will allow Mediavine to offer our publishers multiple payment options. Upon registration with Mediavine, you will select which payment method you prefer and follow the quick, easy and one-time only instructions to complete this process. Please follow these instructions for setting up a Payment Profile. See this document for help choosing a payment method. Please note that some of these payment methods will incur additional fees. For revenue earned April 2016 to July 31, 2018, your transaction history will be available in PayPal, just as it has been in the past. Read our PayPal FAQ. For revenue earned August 1, 2018 through December 2018, you will be able to download your 1099 in early 2019. Please make sure you give both your 1099 and all the transactions listed in PayPal to whomever works on your taxes. Learn more about 1099s. Can I keep using PayPal? If you have been happy with PayPal, you may absolutely continue using PayPal. Just please take five minutes to complete a new Payment Profile and… bam! Never think about payment methods again. You may change payment methods at any time. Flexibility is a major reason why we made the move to Tipalti. The initial registration process is fast and simple, but you also may go in and edit your preferences at any point. Here's how. What if I have more than one site with Mediavine? If you have more than one site with Mediavine, you can set up a different Payment Profile for each site, or have them paid together through the same Payment Profile. For help, please see this guide to setting up payment profiles for your site. There is no need to email Tipalti! Your prompt, friendly and helpful Mediavine support team will continue to be your main source for any and all issues that may arise. You can email us anytime at payments@mediavine.com.